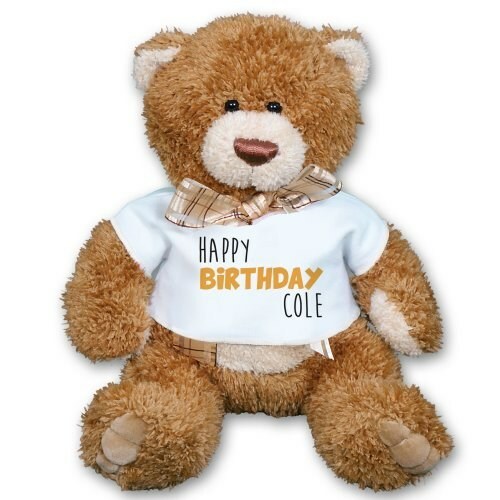 Help make their birthday unforgettable when you surprise them with this one of a kind Happy Birthday Teddy Bear! This birthday design is featured on our Brown Sugar Teddy Bear. Brown Sugar has a rich brown color with contrasting fur inside the ears, on the snout, belly and paws. A classy sheer ribbon finishes off the look. He measures approx. 11" tall and is surface washable. Free personalization of any name is included as well as a free gift message and free gift wrapping to create a thoughtful presentation. Additional Details Shop Birthday Plush Animals to find the perfect gift for your birthday boy or girl.